Aloha and welcome to Beth’s Hawaiian Hideaway in South Kona, on the Big Island of Hawaii. 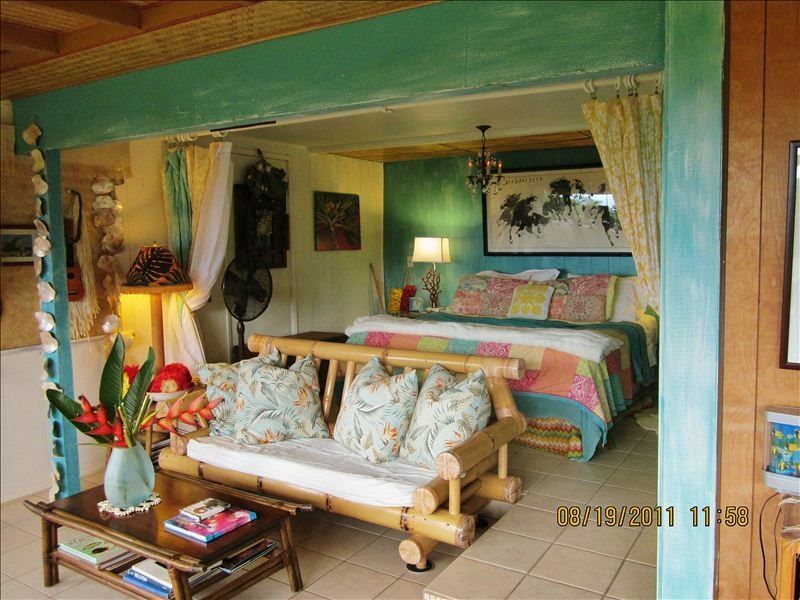 This King bed studio is a romantic place for your stay on the Big island. You may cook your own meals in the kitchen (gas stove top, full size refrigerator & microwave) or dine out-it’s your choice. We are close to grocery stores, shopping, restaurants and many activities and a great jumping-off place for other activities around the island. This adorable and spacious (600 sq. ft.) king studio is open, bright and airy. The entire ocean facing wall of the Hideaway is filled with windows and peaceful views of the lawn, landscaping, trees and the coastline up to Kealakekua Bay. Enjoy the lovely living room area with “elephant” bamboo couch and chairs, cable TV, DVD player and both indoor and outdoor dining areas. Sleep like a baby in the comfy king size bed and relax in the private bath with tub and shower, complimentary robes included. The fully equipped kitchen is there for those who’d like to cook. You have your own BBQ. You will have a separate entrance and privacy in a beautiful residential area. All suites have a TV with basic cable, DVD and internet access. There is also a shared pool. This is a great place for couples or anyone who would like to have a wonderful Kona, Big Island vacation rental that’s much more affordable and offers more privacy than most condos and B and B’s offer. You will have access to four stand up paddle boards and 3 kayaks free of charge. All suites have a TV with Direct Satellite TV , DVD and internet access. We are less than 10 minutes from two great places to snorkel & kayak, (Two Steps at Honaunau) right at the entrance to Pu’uHonua O Honaunau National Historical Park. (City of Refugee) and Captain Cook's Monument, home of The spectacular marine sanctuary at Kealakekua Bay. That offers an abundance of colorful tropical fish, a variety of beautiful coral reefs and visibility often to 100 feet. The calm, protected waters and sunny skies of Kealakekua Bay provide superior snorkeling and diving year round, with the water temperature averaging 76 degrees. The Hideaways have a full kitchen “Paniolo King suite” or efficiency kitchen ”Plumeria Queen suite” for your own meals or we are located near some very nice restaurants. We have wireless connection for our clients. We hope that you will book with us and share our beautiful location. Merci! Merci! Merci! We had such a wonderful time at The hideaway. Everything was beyond expectations! Tout était parfait! Merci Dave et Beth de partager votre coin de paradis. Le studio était propre et bien équipé. Les petites attentions tels les fruits et le café à notre arrivée, le décor, la vue splendide et la sérénité des lieux nous ont permis de passer des vacances inoubliables! Clean, cozy, convenient space with great hosts! We stayed at the Hawaiian hideaway over Christmas. David was kind enough to show us in to the place even though we arrived late on Christmas Eve. The place is far enough away from Kailua to avoid the tourist vibe, but just a short hop down the road. Having the kayaks, SUPs, and boogie boards for use was super convenient. Beth and David were great hosts and available if we needed anything. Such an awesome place to stay. Quiet and peaceful, yet close to snorkeling and restaurants. Perfect! We had an absolutely wonderful time staying with Dave and Beth. Their place is located close to an awesome snorkeling spot, and they provide all the beach and snorkeling gear you need. They were wonderful hosts in every way, and we truly hope to come back and stay again! We really enjoyed our stay at Dave and Beth's! We appreciated all the beach gear and the kayaks! Our Kayak and snorkeling experience out to the Captain Cook Monument is one of the highlights of our trip. The location is terrific and Dave and Beth were very accommodating and helpful throughout our stay! We love the Captain Cook area and the quiet peaceful spot Dave and Beth made available! Our third time here. We come back because the hosts are super nice, the place is clean, comfortable and charming, and the location south of Kona near the beach is fantastic. The unit was exactly as shown on pictures. All the kitchen equipment was of great quality and everything we needed was there. The beach gear was also of great quality whether it was the snorkel gear, the chairs, the cooler. There was even a backpack we could use ! The hosts were very nice and welcoming, they were available when needed but gave us plenty of privacy. We enjoyed the pool almost everyday. Everything was great ! Sorry, no smoking (smoking on the grounds is OK) and not suitable for small children under age of 8.